I just love sweet potatoes and they are so healthy for you. This sweet potato casserole recipe dresses up that gorgeous orange vegetable with one of three different toppings – traditional marshmallow topping, a pecan topping and for those of you who want to try something a bit different, try our crumb topping with parmesan cheese. Cut the sweet potato into chunks and boil in lightly salted water for about 15 minutes or until the pieces are tender. Drain and return to the saucepan. Mash potatoes with a potato masher, adding the butter, milk and cinnamon. Season to taste with salt and pepper. Spoon mashed sweet potatoes into a shallow 1 quart casserole and smooth the top. Add either of the toppings listed below. Bake in preheated oven for 20 minutes. Remove crusts from the bread and break it into small pieces. Process in the food processor until you have crumbs. Mix in the parmesan cheese and thyme. Spread evenly over the top of the sweet potatoes. For those who would rather have the traditional recipe for sweet potato marshmallow casserole, top with miniature marshmallows, spread evenly over the top of the casserole. Bake as directed. Prepare bread crumbs as in the recipe above, then mix with the softened butter and pecans. Spread evenly over the top of the sweet potatoes and bake as directed. The traditional recipe for sweet potato marshmallow topping is here of course. Can’t forget that, but the taste combination in the crumb topping is really delicious. Either way, you can’t beat this easy sweet potato casserole. This casserole works wonderfully for entertaining too. It can be prepared earlier in the day, then just popped in the oven to reheat and brown the topping. 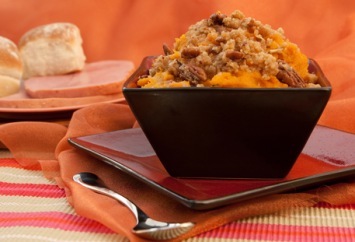 If you like our sweet potato casserole, look here for our other delicious vegetable recipes. Look here for holiday menu ideas.